With the recent dip in temperatures, it’s impossible to ignore that fall is truly on its way. Folks across Atlanta are digging under beds and through attic storage for their cool weather clothes. It’s easy to get overwhelmed with all the unnecessary stuff we accumulate in our closets. Keep your fall wardrobe clean, organized, and ready to wear with these closet organization life hacks. No matter how many door-hanging organizers or shoe racks you buy, shoes always seem to wind up in a jumbled mess on the closet floor. Get ahead of this year’s tripping hazards with two shoe organization tricks. One: Hang crown molding on the wall of your closet and use the ledge to hang heels. Two: hang tall boots by the tops using pant hangers with built-in clips. Can’t ever find the right clutch? Use a lid-holder from the kitchen for easy purse organization. Organize your accessories. Let’s face it: a lot of accessories are out of sight, out of mind. Keep accessories accessible (without adding to the clutter) by hanging them from nails, drawer knobs, or wires on the wall. Keep your closet clothes-only. Instead of fighting with wrapping paper every time you reach for your coat, store holiday paper on the ceiling by suspending two sturdy wires several feet apart and using the makeshift shelf to store rolls of seasonal paper. 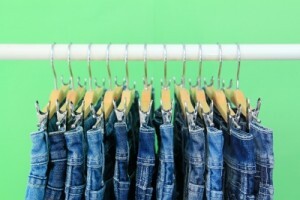 Ready to get rid of last year’s worn out outfits? Call Mr. Junk to haul away old clothes, shoes, and other seasonal junk.